Below I will show you how to remove the word “Home” or your hide the main menu item title from the top of your page. 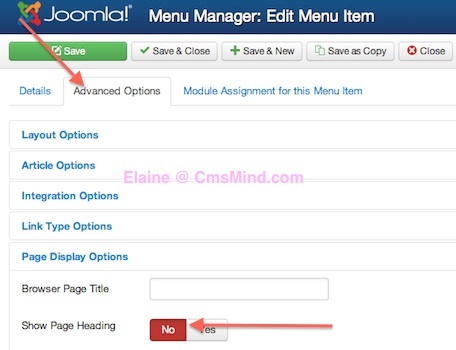 Joomla 3.0 Menu Manager is where you can create new menu items. Menu items are usually Components and component actions that you want to display on the navigational areas on your site. You can assign a default landing page by assigning ‘Home’ to any Menu Item. I’ve assigned to display my featured article list in a default menu item called ‘Home’. So I will edit my ‘Home’ Main Menu Title. 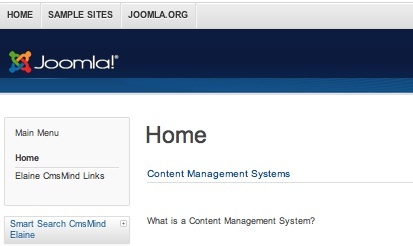 In Joomla 3.0 Main Menu Item you can configure everything how you want your page to display. You can change the layout options, article options, integration options, link type options, page display options and more. If you want to show the Menu Item page heading again, you can go back to step 3 and set ‘Show Page Heading’ = Yes. Hope that helps. Please leave a comment if you have any questions. Yes! Thanks! I’ve been looking all over for this. Did just what I needed. And the advanced options or any other options for menu’s seam to have dissapeared – any ideas ? Been looking everywhere for this solution!! thank you alot!! Thanks for this info, and I know this is an older article, but I have this problem currently and the word home is still on my menu. 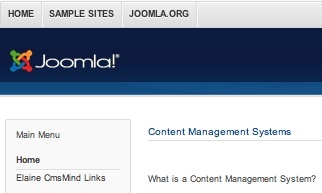 I have Joomla 3, have searched the far reaches of the internet world, and can not find a solution – my main menu remains messed up other than this word sitting there (other parent titles/headings are up and down instead of evenly spaced across and in width, the format seems to be entirely off, seriously have no idea why). I have changed every conceivable heading and title setting to ‘hide’ or ‘no’ for the home menu and nothing is working to get rid of it. The word is currently over the top of the home icon on the menu. If you could help me with both of these issues, (the word, and the menu format problem) I will be forever grateful! This website is not for me, so I am kind of frustrated and need to get it corrected asap. You need to go to “System” > “Global Configuration”, Click on “Articles”, and in the “Articles” tab, change “Show Title” to Hide.